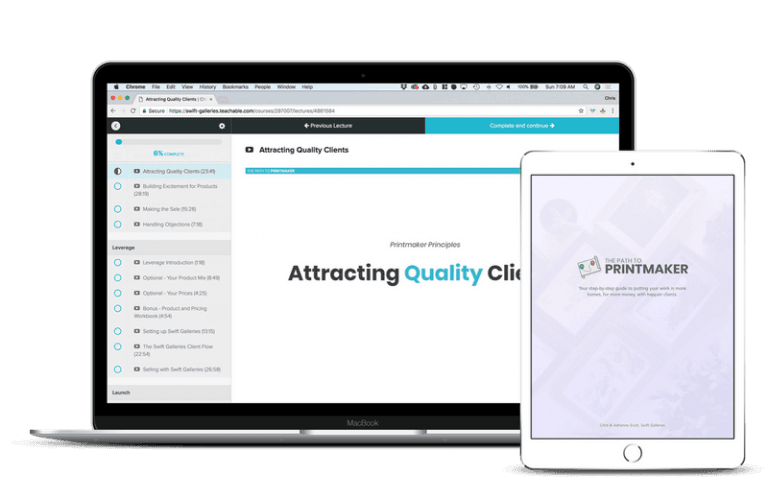 Looking for an alternative to ProSelect for your In-Person Sales Meetings? If you’ve done any research whatsoever about In-Person Sales, then you’ve certainly come across TimeExposure’s ProSelect. 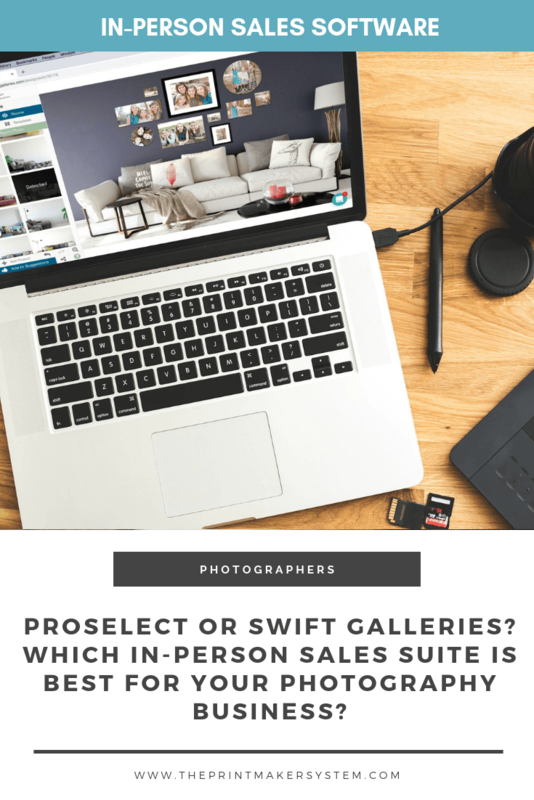 As one of the main tools in the In-Person Sales space for photographers, you may be wondering if ProSelect is the best choice for your photography business (spoiler alert: it might be! ), and how it compares to The Printmaker System by Swift Galleries. *ProSelect is a trademark of TimeExposure, a division of Nate Pty Ltd atf The PMH Investments Trust. Swift Galleries, LLC is not associated with ProSelect or its owners, subsidiaries or… you know… we’re just not affiliated with them in any way. Cool? The problem with comparisons like this is that we’re often not comparing apples to apples (although, at first glance, it may seem so). ProSelect and The Printmaker System were created to serve very different photographers – photographers who need access to dramatically different tools and resources and who are at very different stages in their business. How much am I willing to pay for those features? Do I need more than just a tool (ex: training, coaching, etc.)? With the answers to those questions in mind, you can now make a better, more informed decision about which In-Person Sales tool is best for you and your needs. Who Was ProSelect Created For? ProSelect is an incredibly robust solution for photographers who need every bell and whistle. The tradeoff for those bells and whistles is a premium price and extensive time setting up your software to fit your business. Additionally, many of the features packed into ProSelect won’t be used by the vast majority of IPS photographers. And like many older pieces of software, ProSelect can feel a bit unwieldy and bloated, as feature after feature has been added throughout the years, without any major design or user experience overhauls to support those new features. While feature-rich and used by many successful photographers, ProSelect is a great option for photographers who are already well-established and well-versed in In-Person Sales. However, newer photographers or those new to In-Person Sales will find it difficult to set up, cumbersome to operate and packed with many features they’ll never use, but they’ll certainly pay for. In short, if you’re looking for every feature possible, don’t mind the extra price and setup time, and you don’t need any resources to help you fully incorporate your sales software into a sales process that will work for your business, then ProSelect may be the right option for your business. Who Was The Printmaker System Created For? The photographers who will get the most benefit from what we do here at The Printmaker System are those who are just starting the process of switching their business over from Shoot-and-Burn or Online Sales to In-Person Sales and they’re looking for more than just a tool to help them do that. Our photographers want training, tools and coaching that are all fully integrated with each other to help them make that switch to In-Person Sales as quickly and as seamlessly as possible. Once they’ve made the switch, they want ongoing coaching on running a successful photography business and tools that will continue to support them as their business grows. The Printmaker System is our answer to those specific needs. Is that what your business needs? If not, we may not be the right solution for you. The Path to Printmaker is the bedrock of the entire Printmaker System. 14 implementation-focused video lessons so you never fall into the “always learning, never doing” trap. 3 bonus videos on picking the perfect products for your business and clients and pricing those products for profit. 12 Cheat Sheets, Checklists and Templates to help you quickly implement everything you’re learning. A fill-in-the-blank Product Pricing Calculator to help you figure out how much you should be charging for each of the products you offer, without needing a PhD in Mathematics. 2 Done-For-You product lists give you everything you need to grab them and go – every size, price and suggested price (based on your own time and profit margin numbers) for every product we suggest you sell. Not sure what products to sell? Grab one of these and you’re done, simple as that. What’s a fancy-new sales process for if you don’t have the tools you need to actually put it to use in your business? This is where Swift Galleries comes in. With a focus on being simple, intuitive and good-lookin’, Swift Galleries is the only tool you need to design and sell your work in-person. Use any of our 50+ included room photos if you don't have a photo of your clients' room. Sell all of the wall art products your clients love - framed prints, canvases, metal prints, circle prints, acrylics - you name it, Swift Galleries can help you sell it. Create and save your own favorite gallery designs to use over and over for all of your clients. Happy-dance your way to higher profits by selling large wall portraits and collections rather than yet-another-4x6. Help your clients finally visualize your photos on their walls, without guessing. A beautifully designed Title Screen to welcome your client into the meeting and set the tone for what’s to come. A simple slideshow that puts the attention where it should be - on your photos and your client - rather than on your software. The ability to separate your clients’ "must-have" images from their “no thanks” images by simply tapping the up or down arrow key in the Culling step of your IPS meeting. An intuitive way to compare similar images side-by-side to choose the absolute best of the bunch with your client. The Wall Art Sales Room where you’ll sell your client all of those beautiful wall art galleries you’ve pre-configured for them. Add-on product sales so you can sell anything you want, not just wall art. Think albums, books, small prints, accessories - if you offer it, you can sell it here. A full checkout flow, built right inside Swift Galleries so you can take payment and place your clients' orders right then and there, without having to switch between tools to take a clients’ order. Coaching, community, accountability (and a healthy dose of animated gifs). Meh… a Facebook group? Been there, done that, right? 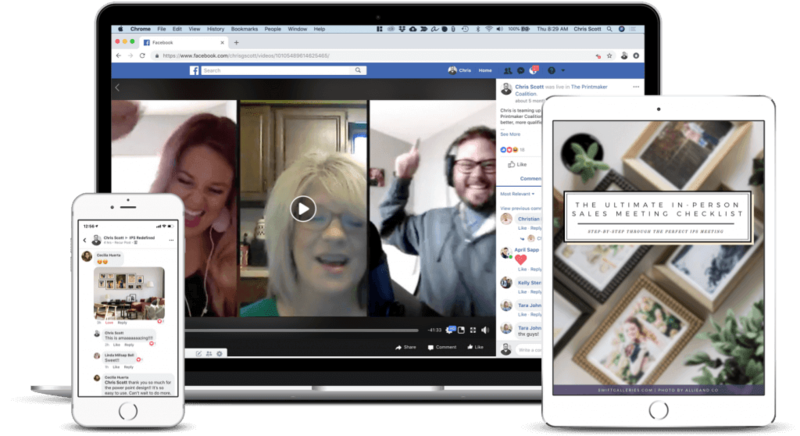 Our "Hot Seat" with Linda Bell where Cyrissa from Sparkle Society and I walk her through the questions you need to be asking about your brand and your ideal client, then figuring out how to craft your messaging and web presence to attract, engage and convert those clients. Sharisse's "Hot Seat" where I give her specific action-steps for attracting and booking more "high-end" clients (action steps that led to her messaging me that she "has more business than she's ever had before" and how glad she is that she "finally found a way to get more clients"). A "Hot Seat" with Tara where I laid out a verrrrry specific action-plan to help her establish herself as a leader in her market and attract clients to her business, for free, using SEO, blogging and an effective email marketing strategy. (Here's a direct quote from Tara from just a week after this Hot Seat: "Hey Chris! So during my hot seat last week, if you remember that I had just joined the local chamber. This is from an email that the chamber director wrote to introduce me to another member (the biggest wedding venue in town that has the in house planners). She totally got my website that I had edited to show that I value printed products!!!! Yes! We had not talked about these things when we met, so it was all because of the changes I had made from following your suggestions! Thank you!!"). My interview with Louise Beatty from The Prosperous Photographer about the ONE thing you need to know to stand out in your crowded market and FINALLY get clients who don't question your prices. This interview with KA Photography's Kylee Ann on marketing, including 3 tips on where you should be marketing TODAY, for free. Yes, it's all included. No, there's no catch. The Path to Printmaker Sales Course - 14 implementation-focused lessons to teach you how to sell, how to use Swift Galleries to support that sales process and how to launch your new process to your past, current and future clients. Swift Galleries Design and Sales Tool - A world-class wall art design and In-Person Sales tool that helps you show clients exactly what their photos will look like on their own walls, then helps you sell those products (and more) through a step-by-step In-Person Sales Flow, built right into the Swift Galleries tool. The Printmaker Coalition Private Facebook Group - The "coaching" arm of The Printmaker System, this Facebook group is where you'll get monthly coaching calls, network with your fellow Printmakers and bounce ideas, successes and pitfalls off one another. You'll also have direct access to myself and Adrienne within this group (and via email, phone or video call). No credit card, no commitment (no, really). Free Demo: How to switch to In-Person Sales using just The Printmaker System.